All Type 5 Wings now include Application Specific Special Mount unless otherwise requested. Voltex created the Type 5 wing especially for vehicles that have a square shaped rear end such as the EVO and GTR R34, but can also work well with widebody cars such as the 350Z, although it has a rounded trunk. The concept is based on having down force and weight distribution when driving at high speeds. This wing is the preferred type for the Mitsubishi EVO for circuit and time attack racing. The wing comes ready to install with standard mounts and 275mm bracket stands. ** NOTE: Wing shown with Voltex 30mm risers. 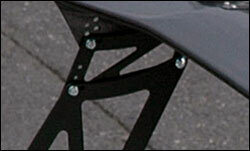 Special Mounts - The special mounts utilize the holes in the trunk that are used to mount the factory spoiler. Therefore, there is no additional drilling when installing special mounts. ** Note: Special mounts are not available on the Honda S2000 or 4 door Integra (DB8). Gurney Flap - Mounts to the top trailing edge of the wing. Named after the famous inventor, Dan Gurney, it creates additional downforce with the GT Wing. It comes pre-installed when ordering with a wing. 30mm Risers - Additional risers that mount between the wing and the stand to give extra height.